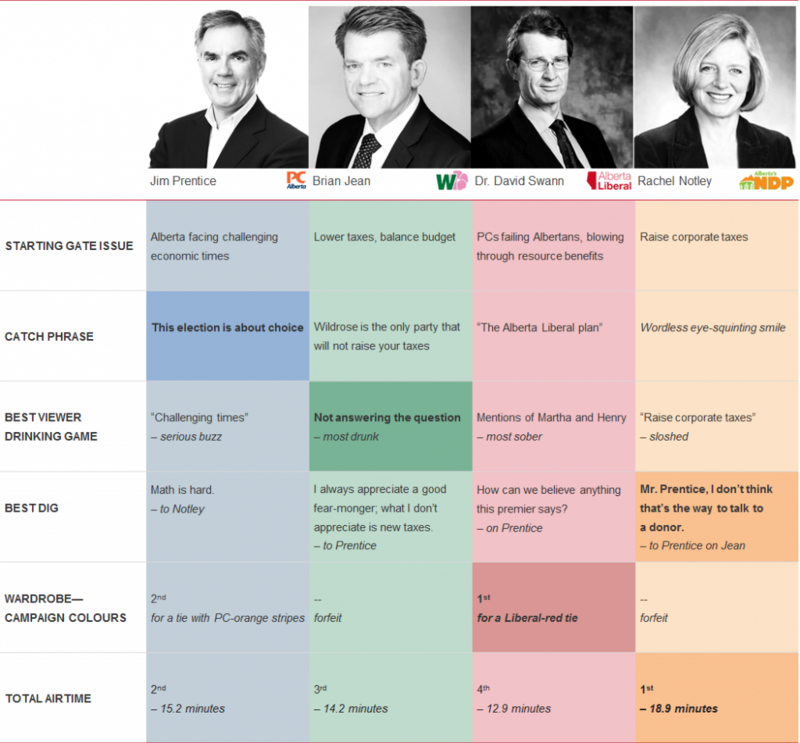 On Thursday, Premier Jim Prentice (PC) faced-off against Rachel Notley (NDP) and Brian Jean (Wildrose), while Dr. David Swann (Alberta Liberal) played largely on the sidelines. The one thing we know coming out of the leaders’ debate—Alberta’s next premier will be a lawyer (sorry, Dr. Swann). As with any debate, we had to have a little fun! Cue: our leaderboard scorecard. We captured and scored the leaders on their key plays—including catchiest phrase, best viewer drinking game and sassiest dig. This was the first time that the environment was significantly profiled during the election, with coal being a contentious point. Jean actually answered the question—an anomaly for the night—saying climate change was real—a response that differed from the Wildrose’s stance in 2012. Notley vowed to end Alberta’s reliance on coal, attacking Prentice on how he handled the coal file as federal minister. Prentice shot back, asking how Notley planned to pay billions in penalties to shut down the industry prior to the agreed date. Continued disagreement on the effect of raising corporate taxes: Prentice against because it would cause job losses; Notley for because everyone should contribute. Lively discussions over a two-tiered health system: The other three agreed Jean’s plan to allow Albertans to access procedures out of province and reimburse up to the amount of the procedure in Alberta would only benefit the rich. Education and school infrastructure funding: Prentice trying to defend the government’s current school-building efforts with no disagreement on how many of the promised schools are being built. Coalition building should a minority government arise: Only Jean vowed not to share the sand box with any other party. Sharing is good, Jean. This debate was unmistakably about who Albertans see as the best to lead the province forward, with Prentice and Notley as the stand-outs of the night. The question now: did the leaders’ performances resonate with Albertans and will this debate have any impact on May 5?